The Tower of the Elephant by Robert Howard (1933): If you do a collection of the works of Sword & Sorcery writers both current and past, there really is no way you could not include Robert Howards Conan. The Tower of the Elephant is widely considered a classic and iconic story, but I think personally it’s one of the weaker ones and painfully simply structured. I think there could have been much better choices than this. Black God’s Kiss by C.L. Moore (1934): Jiriel of Jory is another character regarded as one of the classic Sword & Sorcery heroes, though a relatively unknown one these days. I hadn’t read any of her stories yet, and it certainly is interesting. However, I think I am being generous when saying that this story was “heavily inspired by” Robert Howards Worms of the Earth. Yes, it’s not a bad story, but a strong candidate for the Vanilla Ice Test: “If you remove the parts that were taken from another artists work, is the rest still good?” (The only good part of Ice Ice Baby was the sample from Queen.) And I have to say, not very much. There are some original ideas, but they really don’t shine out that much in a story that already isn’t that stellar to begin with. I am not judging Moore on this single text, but to present her work to a new audience, I think this wasn’t a good pick. The Unholy Grail by Fritz Leiber (1962): Oh dear. I think I admitted before that I have a rather complicated relationship with Leibers stories. I think they range from not very good to pretty bad, but almost always they are still fun to read. Not only did he come up with the name Sword & Sorcery for swashbuckling heroic fantasy with darker undertones, he also was able to bring the best parts of this genre to shine even though his plots were not that great and his characters and dialogs generally quite bad. He may not have been a good writer, but he knew what made this strain of heroic fantasy tick and codified it, which very much earns him the reputation as one of the three grand masters of Sword & Sorcery. But, oh boy! The Unholy Grail would be his Fafhrd and the Grey Mouser story which I consider to be by far the worst! Fafhrd doesn’t actually appear in this one, and the Mouser is a completely different person from his usual self. Since it’s an origin story Leiber may have had reasons for that, but as a sample of the iconic duo of Sword & Sorcery, this is probably the worst possible pick ever! The Tale of Hauk by Poul Anderson (1977): I’ve heard that mans name before and I think he has some big fans, but I never read anything of his or even know what kind of works he is known for. If there is one ultimate rule of writing other than avoiding Deus Ex Machina, then it’s not starting a story with an infodump. The full first quarter of the story is nothing but a single big infodump, which actually doesn’t matter to the plot at all. And even after that, the actual plot only begins around the halfway mark of the story. Unfortunately, the actual story itself isn’t very interesting. I hate to bring this up in seemingly every review I do, but this story isn’t really Sword & Sorcery at all. Yes, the story of Jiriel of Jory also takes place in France, but once she goes down the rabbit hole (which happens just a fifth into the story), she clearly isn’t in Aquitaine anymore. The Tale of Hauk is just a simple Nordic ghost story. And not even an interesting one. The story takes a lot of time to show off lots of minor and subtle elements of Germanic culture, of which I think most will only have any meaning to people who are as familiar with them as Anderson himself. At the same time, he is forgetting that there needs to be an actual plot for the story. It’s not a completely horrible story, and I’ve come across those in the past, but not something I would include in any Best Of anthology. 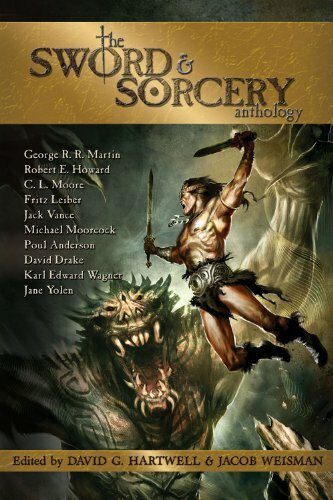 And in a Sword & Sorcery collection, it really is quite out of place. The Caravan of Forgotten Dreams by Michael Moorcock (1962): Like Howard and Leiber, ou can’t really make a Best Of Sword & Sorcery collection without Moorcock. 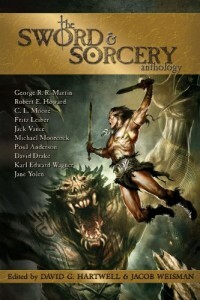 When Leiber proposed the name Sword & Sorcery for the genre that had not yet been defined, but already quite clear in the mind of several people, he was actually replying directly to Moorcock who had called for a catchy title they could be using. The Caravan of Forgotten Dreams is a strange name for this story, as there aren’t any caravans in it, nor was I aware of any lost lore or visions of a better future. Before this one, I’ve only read a single one of Moorcocks Elric stories, but I think it was much better than this one. The dialog is clunky, as the two characters mostly talk to give information to the reader that they both already know, and there really isn’t any effective buildup or context given. A huge army destroying every country it comes through and now it reaches the city where Elric lives, so he and his sidekick sneak into the camp to take out the hordes sorcerer. They run into a dozen warriors who try to kill them, but given that the story is just starting, they are just a dozen unnamed ruffians, and they are going against what I assume to be the most terrifying sorcerer-knight in the world, the whole encounter is pretty pointless. Of course the heroes will butcher them without breaking a sweat. There’s an interesting part in the middle, where they have joined the horde and are still trying to work out a plan, and the horde is raiding another town. Elric and his sidekick feel bad about it, but they can’t do anything to stop thousands of warriors by themselves. That part could have been interesting, but is rushed through just as fast as everything else in this story and nothing comes out of it. In the end, the story is wrapped up with two Deus Ex Machina right after the other and the story is over. This wasn’t great, and I am sure Moorcock didn’t get famous because of this particular story. The Adventuress by Joanna Russ (1967): This story is not fit for publication. I don’t have the faintest trace of an idea how this one ended up in a collection of the greatest Sword & Sorcery tales. Not only does it has nothing to do with Sword & Sorcery, it is also remarkably poorly written. There is no real discernable plot, the scenes are confusing and erratic, and the whole time I had no idea what’s going on. It’s about two unlikable women who do nothing but bitching at each other, one being constantly hysterical and screaming, the other lazily passive agressive. On the last few pages there is some kind of development of the two characters starting to respect each other, and while that may be a decent theme to write about, the story doesn’t have anything to do with Sword & Sorcery. As I said, this text is not fit for publishing. Gimmile’s Songs by Charles Saunders (1984): I hadn’t read anything by Saunders before, but heard quite a lot about him. And based on this one short sample, he seems to be clearly one of the better authors who write for this genre. The story deals with sorcery, which is nice for a change, but lacking in any daring adventuring. It’s a decent story, but I didn’t find it exciting. Undertow by Karl Edward Wagner (1977): On okay story. I think the twist at the end was too strongly telegraphed and predictable halfway through the story, and the mystery is mostly created through putting the scenes out of order and deliberately witholding important information from the reader, which usually are very cheap tricks. But there’s still a nice eerieness to it, and Wagners famous character Kane as a secondary character in the background work actually quite well and is genuinely creepy, which makes the story worth a read. The Stages of God by Ramsey Campbell (1974): A disposed king stumbling through the wilds and nothing much happens. There’s an encounter with a giant monster and two magical battles, but each of them gets covered in just two sentences and it’s all very boring. The Barrow Troll by David Drake (1975): This one isn’t terrible, but mediocre at best. One of the two characters is very bland, the other so unspeakably reprehensible that you almost immediately figure out what will happen at the end. This is not an anti-hero but a guy specifically written for damnation.